Roasted turkey legs are perfect anytime, and also for small Thanksgiving gatherings. Roasting at a high temperature ensures crispy skin and juicy meat. Roasted turkey legs are so tasty and satisfying! I serve them often for dinner. I also like to serve them for Thanksgiving instead of roasting a whole bird. Not everyone wants or needs to roast a whole turkey for Thanksgiving. Perhaps you plan on a small Thanksgiving gathering. Or maybe your family members have a strong preference for either white or dark meat. Either way, roasting just a couple of turkey breasts, or a few turkey legs, has some clear advantages. Such as a shorter roasting time and a better tasting bird. Roasting just parts of the bird means avoiding the issue of white meat that becomes too dry by the time the dark meat is fully cooked. How do you roast turkey drumsticks? I realize that many recipes will tell you to roast turkey legs for an hour and a half at 350 degrees F. But as always when roasting poultry, I find that roasting turkey legs for a relatively short time at a high temperature yields the best results! 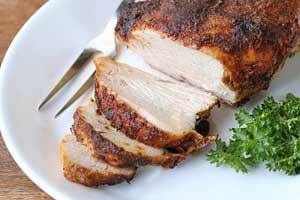 Crispy, well-browned skin and juicy, succulent meat. I believe so. Unlike processed turkey meat, which is not very healthy, fresh turkey meat is healthy. It’s a good source of protein, vitamins B6 and B12, Niacin, choline, selenium, and zinc. Dark turkey meat is richer in vitamins and minerals than light turkey meat. How to serve roasted turkey legs? For Thanksgiving, you will likely serve them with your favorite Thanksgiving side dishes. 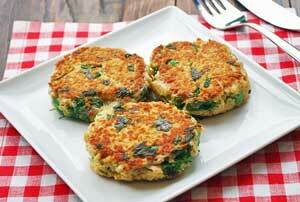 At other times, they are very versatile and can go with many side dishes. I often serve turkey legs with roasted pumpkin slices, with baked jicama fries, or with roasted mini peppers. You can keep leftovers in the fridge, in an airtight container, for 3-4 days. Reheat them gently, in the microwave on 50% power. Roasting turkey legs at a high temperature ensures crispy skin and juicy meat. Preheat oven to 450 degrees F. Fit a roasting pan with a roasting rack and spray the rack with olive oil spray. Pat the turkey drumsticks dry with paper towels. Brush the turkey drumsticks all over with melted butter and rub with the seasoning mix. Place on the roasting rack. Roast uncovered for 20 minutes, until the skin is well browned. Loosely cover with foil, to avoid scorching the top, and continue roasting until juices run clear when pierced with a fork and an instant-read thermometer registers 165 degrees F (make sure it isn’t touching the bone), about 30 more minutes. Remove the roasted turkey legs from the oven and allow to rest, still covered in foil, for 10 minutes before serving. Do not skip this step - it allows the internal temperature to climb a bit more, and the juices to redistribute and settle.